Hi there, I’m Ava Miles, a contemporary romance writer, who received Nora Roberts’ blessing to use her name in my first book, NORA ROBERTS LAND, which was my first and released this summer. It kicked off my Dare Valley series. I quit my day job as a conflict expert rebuilding war zones and dove head-first into writing full-time as an Indie writer. I’m from a small town in the Midwest, and I set my series in a small town as well since I love the setting. I used to be a chef, so food figures prominently into some of my books, which also means that I love to cook. I also love to garden, sculpt, paint, meditate, and take long nature walks. I’m the oldest of six kids, so family features prominently in my stories, and readers have commented on how the interactions between the siblings in my books seem so real. 🙂 Yeah, there’s a reason. I’ve probably had that interaction, anything from stealing clothes to trying to coax a quiet brother to talk about his feelings. My blog is called The Happiness Corner because I love to talk about all things happiness. For me, life is one big adventure, and I’d like to be happy while traveling. It seems as if I’ve been penning stories for fun forever. Like most writers, I had a spiral notebook in grade school and wrote whatever came to me. In high school, I wrote my first few chapters of a romance novel and got hooked. One of my best high school gifts was a Plot Journal from a former English teacher, which I still write in. And then it morphed into single title books, and it made me so happy, I just knew I had to follow its path. I write in contemporary, and for me, there’s something special about writing stories set in the current times. It allows you to work with the unique themes of the day while weaving in the universal themes like love, empowerment, and forgiveness. The writing. The act of creation: the characters, their lives. They’re the flesh and blood of the story, and, there’s nothing better. The characters become my friends, and the places they live in are the ones I want to live in. It’s magical. Since I love creating things, I have to say the editing. There’s nothing new or creative about that. I’m trying to appreciate the polishing, the tightening, and the strengthening, but if I could find an Editing Fairy, I would hire her in a second. I have an editor, of course, but I mean a fairy who would do it before it gets to my editor. Hehe. Well, there’s no one place. Often a character appears to me and starts telling me his or her story. It’s like they’re on the stage, telling me about themselves, and then acting out a scene in the story. I pretty much write down what they say. If I try to “direct,” it never works. They don’t like it, and remind me, so I pretty much let the story flow now. That’s when the magic happens. Everything is so real. Everyone is multi-dimensional. I invite them into my dreams, and as such have dreamed chapters. I also meditate every day, which helps me hear and see the story better. I don’t always get the book in order. I write the scene that the characters want to show me. I pretty much go along for the ride, and honestly, they have never led me wrong. A typical day? I don’t think I’ve settled into that yet. I’m connecting with readers on social media every day, but beyond that, I could be writing, blogging, designing a cover, handling the business side. Did I mention writing? I just try and go with the flow. Everything works better that way. My next book will be out February 11, 2014 and is called COUNTRY HEAVEN. It’s the first book in a connected series called Dare River, which is set down South, outside Nashville. In THE GRAND OPENING and THE HOLIDAY SERENADE, one of the characters is friends with a country singer, and I just knew he needed his own story, and thus The Dare River series was born. COUNTRY HEAVEN is a modern beauty and the beast story where the beauty tames/tempers the beast through food. He stops by a diner after a concert and has the best meal he’s ever tasted. Asking to meet the cook, he offers her a job as his cook on his tour bus, and so the journey begins—or at least until he discovers the father who disowned him for becoming a country singer has had a heart attack and wants to reconcile. So he takes the cook with him, and together they both learn what family means and how to forgive and reconcile. After that it will be back to Dare Valley in the spring with THE PARK OF SUNSET DREAMS, and I’ll alternate putting out Dare Valley and Dare River books. It’s going to be fun, writing stories in the two regions I’ve lived in, out West and down South. 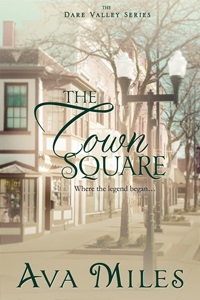 BE SURE TO COME BACK to read more about Ava and her release, THE TOWN SQUARE (Dare Valley Series), on Wednesday’s Karen’s Killer Book Bench!! Happy Reading! I loved Nora Roberts Land! Can’t wait for the next one. Thanks for stopping by to answer questions. This sounds so good. Can’t wait to read your books! I love your stories. Each one has it’s own unique signature even though set in the Dare Valley. Looking forward to reading more of them as time and money becomes available. Thanks for taking the time to answer all of the questions. Loved Nora Roberts land…can’t wait until I can get the next one, French Roast! What a great interview. I love contemporary and I think you are right in there are so many issues that there’s a lot of draw on for stories. I love the fact that your high school teacher saw the gift you had and encouraged it with your plot book. Do you still see her/him and do they know your a published author? Thank you for the contest! I love discovering new authors through contests! Have Nora Roberts Land waiting tbr on my kindle – can’t wait to read!